I am fairly new at landlording. I've been at it maybe 2 years and have had mostly positive experiences. I have a few section 8 rentals. An older woman just moved in a SFH and complains of being constantly cold. She says the heat wont stay on (handyman checked - it heats to the set temp, 80 degrees and then turns off). The previous tenant never mentioned a problem. The furnace is maybe 10 years old. The house feels warm when I walk in. She has a space heater going in her bedroom and sometimes uses the oven in the kitchen. She hasn't been sleeping at the house because of the cold and it isn't even winter yet. What should I do? Should I let her out of the lease? This would be a hard time to replace her but an unhappy tenant is a headache. I am going over this week to winterize the windows with plastic. Have a *licensed* HVAC tech look at the unit, not your handyman. If they give it the thumbs up in writing on the invoice, not your problem. Older people have decrease circulation, they start to always feel cold as they age. Thanks, Levi T. I'll make the call. Get an HVAC guy there... and if she's a good tenant, I'd try to be friendly with her... ask about her circulation. In a very nice way, you don't want her thinking you're saying it's in her mind or anything. Maybe what she needs is a trip to the dr. As mentioned, older people often have trouble with circulation. Personally, I have always had personal relationships with my tenants. I know, it's supposed to be all business. But there's a mix. When rent is due, it's business. If you don't pay, you get a 10 day notice. Period. First day... but if they're good tenants, I remember their birthdays, give Christmas cards, and certainly, have no issues asking them if they have thought of seeing their dr. You can be friendly without being friends. Additional: I just called my HVAC contractor, they reminded me they were out last month and replaced a part. It was working fine when they left. That doesn't mean that it hasn't broken since then... just that a licensed person has looked at it. Confirm the heat is working properly. If it is get rid of her. Using space heaters and the oven to heat is dangerous and could ultimately result in a house fire. Tenants should never be allowed to use space heaters. That should be a condition in your lease. Better to deal with the effort and cost of finding a tenant that is not crazy than dealing with fire damage. I've never heard of not allowing space heaters. The oven 8-O but not space heaters. Is that common? I am sending out my HVAC guy now. So by get rid of her Thomas S., should I let her out of the lease? Get rid of her, let her out of lease all, she's accident waiting to happen and write her up for not properly using appliances,, NO space heater should be used in your lease,, that alone unattended is a fire hazard. I agree with @Deanna McCormick fully on this one. You are not going to satisfy this tenant. 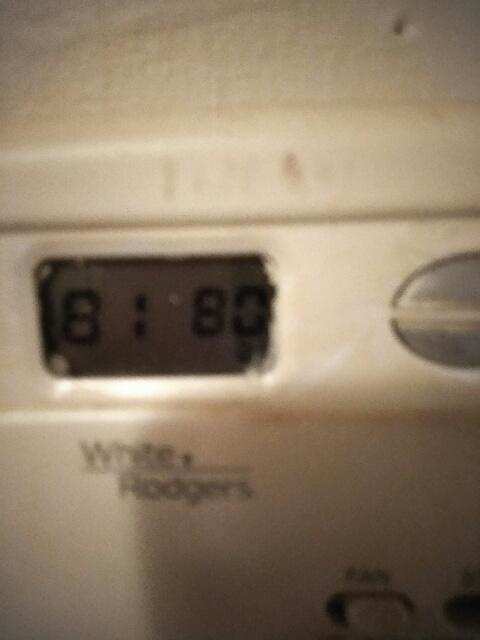 A thermostat set at 80 is enough to give me the sweats just thinking about it. From a cost and heat perspective (And I am further north than you). Sometimes there are just "bad dates", doesn't mean they are "bad people" just not the kind you want to be married to. In this case I would let her break the lease to find a place that is more in line with her requirements. Not uncommon at all for an older tenant to complain. My grandmother used to wear a sweater to our fourth of July party. I had a brand new gas hot air furnace installed on one unit and that thing could bake a turkey if you left it on the counter. My tenant called at least once a week saying there is something wrong with it. Every time I went over there, it was 80 degrees in there and I instantly started sweating just talking to her. She was wrapped up like she was about to take on Everest. I told her there is nothing wrong. I bought an indoor thermometer from the hardware store and gave it to her. I told her to call me ONLY if that thermometer shows less than 70. That is all good advice. That's in line with what I was thinking. I'd rather lose some money than deal with a nuisance tenant. I've been thinking that maybe I just needed to "train my tenant" as some of the books talk about but it doesn't seem to be working (or else I'm bad at it). I think instead I need to cut bait. My HVAC guy is going today... If he doesn't find something that changes everything I will have a conversation telling her I will allow her out of the lease and that she can start looking for a place. Whether it's her, or another tenant, you must make sure the heat is working properly. If he says it's good, I'd have a nice conversation about if the rental is a good fit for her or not. I'd specifically explain that the HVAC is the only allowed heat source, no other appliances are permitted, and if it's not powerful enough, suggest you guys part ways. Stress that you won't be making any other adjustments to the unit, so if it's not good, then she is likely better off at another home. We often tell people "It's a 2 way street, and we want to make sure you're happy" which sounds really nice, but it's a subtle way of telling them we aren't doing anything else, this is as-is, take it or leave it. The comment about the space heater throwing off the thermostat is right on. I have to tell the tenant with the house thermostat in their living room they can't open the window during heating season. I recommend something like this USB logging thermometer in a thermostat lockbox as a way of documenting the actual temp if you have to deal with authorities (lady above was S-8). It will record the temp at your programmed interval, then you can plug it into your PC and download the data as a graph. thought I would finish this off... the hvac guy found some problem of overheating and repLaced something. So she was right. Then she called right back and said it was still messed up. He went back and says it’s fine. I will have the tough talk when she calls again. I figure I’m eating the final service fee for the guy going back and finding no problem. @Greg Smith , I think I see your tenant in THIS VIDEO! You can find her at the 1:29 mark.